expand his production to preamplifiers and accessories. Reading the list of testimonials on the web site is like walking in the hall of fame of music. It's not easy to get an hold on these components to test them because their production is limited and waiting times are usually very long. When the distributor gets them they have to be delivered straight away and, on the used market, these equipments are a rare item and are sold in a blink of an eye. My first and only test - until today - of a pair of Huber amplifiers, dates back to 7 years ago and had a surprisingly good result. Since then, I've had the chance to listen to the whole output of Swiss amplifiers but never again in specific testing conditions.That test brought me luck in fact here I am once again to speak of Hi-Fi sound and of the ability of human beings to bring into our houses a wonderful sound although at a very high price. I don't want to argue with those that want the maximum performance at the minimum expense, here we are not dealing with dreams but with real things and these four small and lightweight devices are real: the FM155 Preamplifier, the Linearizer FM133 (please, not equalizer!) and the two mono power amplifiers FM108. At a glance it's impossible to guess their economic and performing value. I'd compare them with Jewels (in fact they have golden switches), small and precious. 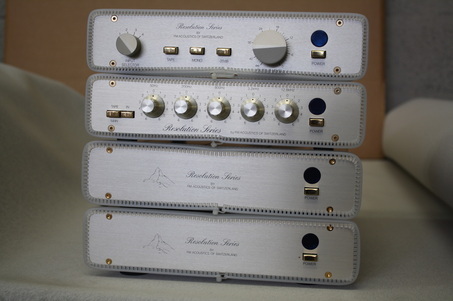 The power amplifiers weight around 4,5 kg each. Each one of them can deliver 130 W RMS on 4 Ohm. The four devices we are testing belong to Resolution Series. I think that Classic Series has been discontinued now. But I know you are eager to know the details so let's describe the FM155 Preamplifier. The front panel - from left to right - has a switch for the four line inputs, a button for the tape monitor, another one for the mono function, a 20 dB fader, a volume knob and the power button with on top the beautiful FM logo that shines in a pale green. The back has an input for the power cable (you cannot play with it) a switch for the ground connection, the outputs (unbalanced like all the other connections), tape monitor inputs and outputs and the four line inputs. We should dwell a little more on the FM 133 Linearizer. FM states that the signal that goes through the Linearizer undergoes no negative influence. The signal passes straight through the Linearizer while the "Constant Phase Linearizer Bank" only adds or subtracts upon necessity. This component is useful mainly because corrects the problems of recordings, as FM points out, and not the problems of the listening environment, although its use may reduce them. A short description of its front panel: the switch for the tape monitor, the bypass switch (that shows us that the device is completely transparent and can be left always connected) the 5 frequency control potentiometers (50,200,800,3200,12800 Hz), the on/off switch button. In the back there is the proprietary input for the power cable, the switch for the ground, inputs and outputs for a tape monitor. As for the small Power Amps, nothing to say. The on/off switch and the logo in the front while in the rear we find that the power cable in this case is fixed. There are two binding posts for the loudspeakers that seem to be of good quality and are fit for all kinds of connectors, a fuse, the small heat sinks, the gain control and the....balanced input! Oh yes! 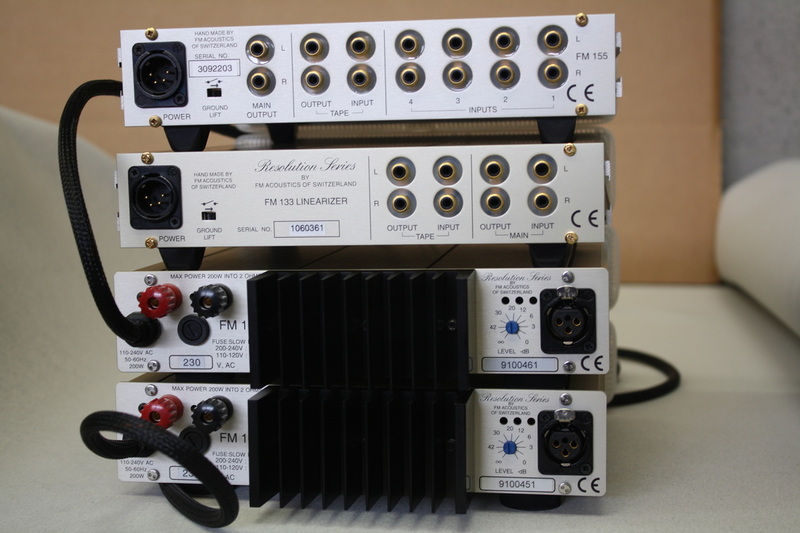 Outputs from the Preamplifier unbalanced and inputs in the power amp balanced. Must be the Swiss way! You'll have to get a cable with different connections on the two sides. FM Acoustics writes on its manuals that if you don't use their cables, you'll be in troubles! Well, not exactly like this but if you don't, the warranty might not be valid. FM cables for everyone, then! I wanted to take a picture of the inside but they are sealed with screws with a special thread that have only two small holes and I don't have the right tool to loose them. FMs have been listened in the following system: Turntable Basis 2001, Graham 2.2 tonearm, Scan Tech Lyra Helicon cartridge, phono cable: LAT International XLR, phono preamplifier: balanced Einstein "The Turntable's Choice", cable between the pre phono and pre amp: Transparent Super XLR, CD/SACD player dCS Puccini+U-Clock Puccini, loudspeaker JBL 4350B, loudspeaker cables: MIT Magnum MA, power cables: MIT Shotgun AC1, Black Noise Pearl and others hand made, net filter: Black noise 2500. Let's say first that I could not use the turntable since my phono preamplifier is balanced. This time I won't list the records I listened to during the test. I want to describe the sound of these components, just like I heard it with my equipment and especially how I heard it with my ears. The sound that comes out of these electronics is captivating, a siren chant that does not leave indifferent. The sound, that is very transparent and dynamic, is not followed by that coldness that sometimes is defined as neutrality. The sound is nice and round in the medium-high range and presents a music that one can listen to without wearing out one's ears. The power amplifiers respond quickly to the strains of the transients and follow each instrument with precision. Their power is not unlimited and these devices won't create stadium like music pressures. But how many of us need it? The Linearizer performs its duty in a perfect way but, to be straight, we have used it very little since we have used for this test tone balanced recordings. During the days in which FM have sat pleasantly in my room I have rediscovered a sort of "slow listening", a "slow food" for my ears. There is something in the sound of these Swiss machines that induces a nice relaxation during the listenings. The sound is never hectic and they can take out a pleasant sound from many modern loudspeakers that have a squeaky and tiring sound. They come from Lake Zurich, among the mountains, but their sound reminds of a misty hot Caribbean dawn and not of the cold and clear one of the mountains. The medium range is wonderful and recalls that of the best vacuum tubes but without showing their distortions, both good or bad. Nothing to say also for low range frequencies. These are as correct and defined as you may desire. These are great devices that might make you fall in love and if so, after them, you won't have to look for anything else except for the superior models if you want to change something. Listen to them, they are unique and a must for your listening sessions.